The big WordPress scoop of the day is the deal struck with the creators of WooThemes Custom Navigation to include it’s code into the core of WordPress 3. This is a major addition that will add some really cool functionality. Currently WordPress only lets you list all your pages or all your posts. There are plugins available that let you exclude certain pages / categories from these lists, and with some custom php coding trickery you can have more flexibility, but ultimately you are quite limited. When we build sites in WordPress, we generally resort to hard-coding the menu which allows us to get the menu items we want but means that it can’t be edited by the client once the site goes live. 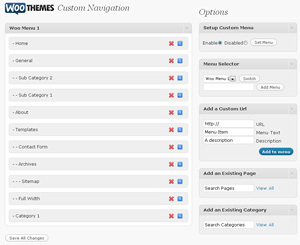 Woo Custom Navigation lets you create your own custom menu system from within the WordPress Dashboard. You can mix any existing pages / categories and also add new links such as pages on external sites. A user friendly drag and drop interface lets you define multiple navigation menus and they can feature sub items for drop-down menus. We’re really looking forward to trying this out, the beta release is in March so we will be having a play then, but the official release isn’t planned until May so we won’t be implementing this in new sites until then. You can read more about the deal on the WordPress blog, or watch a video demonstration on the Woo Themes site.